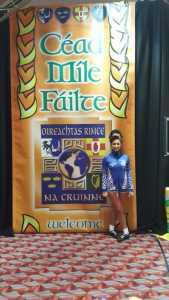 Powerday’s Sales Coordinator, Kerri O’Toole, finished in the top 50 at the 2018 Irish Dancing World Championships held in Glasgow last month. As well as achieving a top 50 finish as a solo dancer, Kerri also participated in the team event, finishing a fantastic 22nd. The event at the Royal Concert Hall saw dancers from all over the world compete for medals. Powerday sponsored Kerri and the team and we are all hugely impressed by hers and the team’s achievements. Congratulations Kerri!